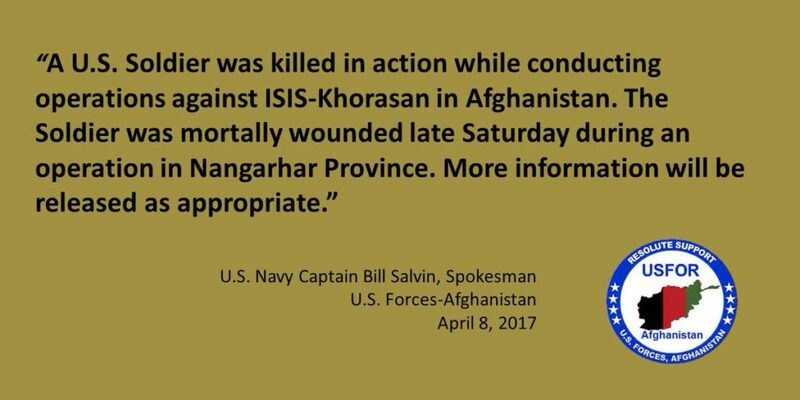 An American soldier was killed while fighting the Islamic State’s arm in Afghanistan earlier today, according to US officials. Salvin later told Reuters that the American was a Special Forces operator. Nangarhar, an eastern Afghan province, is the main hub for the Islamic State’s operations in the region. Just hours before the US military’s announcement, the Islamic State released a statement claiming that four Afghan soldiers had been killed and a “Crusader American soldier” wounded. The jihadists said they initiated the raid against their enemies. Inghimasi fighters are highly-trained jihadists who immerse themselves in the fight and are prepared to commit suicide bombings, if necessary. Abu Muhammad al Adnani, the Islamic State’s first spokesman, announced his organization’s expansion into Afghanistan and Pakistan in Jan. 2015. The Islamic State’s Khorasan branch, known as Wilayah Khorasan (or Khorasan province), was headed by Hafiz Saeed Khan, a former commander in the Pakistani Taliban (Tehrik-e Taliban, or TTP) who announced his allegiance to Abu Bakr al Baghdadi in late 2014. Khan was killed in a US airstrike in July 2016. Khan was not the only significant Wilayah Khorasan figure killed or captured in 2016. The US military has repeatedly targeted Baghdadi’s loyalists in Afghanistan. According to General John W. Nicholson Jr., the commander of NATO’s Resolute Support and US Forces Afghanistan, 12 Wilayah Khorasan leaders (including Khan) were killed in 2016. Nicholson added that the caliphate’s Afghan branch incurred “roughly” 500 casualties in total, which is an estimated “25 to 30 percent” of the organization’s overall force. Therefore, based on the US military’s figures, Wilayah Khorasan had between 1,600 and 2,000 total fighters before suffering from attrition last year. However, the Islamic State still has a lethal network inside the country. And while the so-called caliphate’s men don’t contest or control nearly the same amount of territory as the al Qaeda-allied Taliban, they can still carry out significant attacks. Wilayah Khorasan claims to have killed other Afghan soldiers in recent days, including in mortar attacks in Nangarhar. FDD’s Long War Journal assessed early on that Wilayah Khorasan incorporated disaffected commanders from the Afghan and Pakistani Taliban, as well as Uzbek jihadists who defected from groups allied with the Taliban and al Qaeda. However, the Pakistani Taliban was reconstituted, most of the Afghan Taliban remains loyal to its leadership, and pro-Islamic State Uzbek jihadists suffered significant losses in the rivalry that ensued with their counterparts in the Taliban-al Qaeda axis. After eight years of silence, the media is going to start putting draped coffins on the screen again?